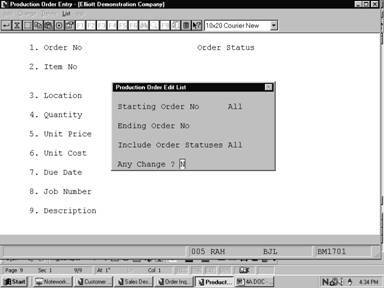 The Production Order Entry application allows the entry of production orders. These orders may be later modified, deleted, or printed on the Production Order Edit List. Once the orders are verified as correct, they may be printed on the Production Schedule Report. Entry of orders in this application automatically adjusts the quantity allocated levels of component items and the quantity on order levels of parent items. A production order is assigned one of several statuses based on what stage of the production process it has reached. An order that has only been entered has a status of "New". 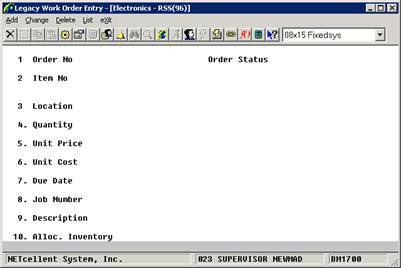 After a work order has been printed in the Print Production Work Orders application, its status displays as "Printed". Only orders that have not been printed may have changes made to them. If progress on the order is recorded through the Production Transaction Processing application, its status is changed to "Partially Reported". Once a transaction is posted with a complete status indicated, it is considered "Complete". Work orders that have not been printed or had production reported may be changed or deleted in this application. Once they have begun the production process they must be handled through the Production Transaction Processing application. See that section and the Package Overview section of this manual for information on changing and deleting orders. Frequently, the quantity of an item eventually manufactured does not match the original quantity entered on the order. For information on handling over-production and under-production, see the Production Transaction Processing and Package Overview sections of this manual. For information on handling cancelled orders, overshipments, and returns from customers, see the Package Overview section of this manual. “Legacy Work Order” refers to the original BOMP work order. It provides an easy way of entering production work orders and back flushes the materials at time of production reporting or printing of the work order (with WIP option). The main weakness of the Legacy Work Order is it does not have the ability to capture the bill of materials per work order. If you change the bill of material structure and have outstanding Work Orders in the process of production, based on the previous bill of material structure, you will have an integrity issue. In addition to the “capture of bill of material” issue, when the work order is completed and the material is back flushed, there is no way to report any variance. Variance can happen when there is a defective component or simply production waste. Variance can also happen if there is a substitution of components. In the past, this type of variance was typically handled by a manual adjustment through I/M Inventory Transaction Processing. Material Work Order is designed to address the shortcomings of the Legacy Work Order. Not only will it capture the bill of materials when the Material Work Order is created, it also allows the user to change the copied bill of material if necessary. 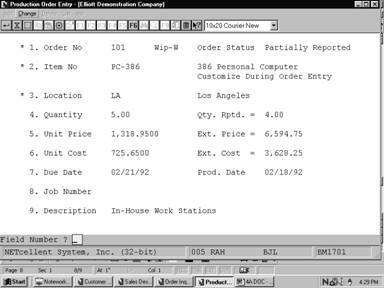 Upon production completion, the user has the flexibility to report variance of quantity, as well as substitute different components. Since this new type of work order offers total flexibility with component materials, we call it “Material” Work Order. Material Work Order is a super set of Legacy Work Order. Therefore, the default choice now is to create a Material Work Order. We are still supporting the Legacy Work Order for backward compatibility. Most of the menu choices in BOMP Processing now have two choices, “Material Work Order” and “Legacy Work Order.” At this moment we do not support the WIP option with Material Work Order. Therefore if you need to use WIP, you will need to continue using the Legacy Work Order. * Select the desired mode from the Production Order Entry menu bar. Enter the production order number, which will be used to track the order through the production process. In add mode, press the F1 key to display the next sequential production order number. In change mode, once this field is displayed it may not be changed. The current status of the production order is automatically displayed. The status will be displayed as new, work order printed, partially reported, or complete. Enter the number of the item to be produced. This item must be in the Inventory Item File and may not be designated as a kit item. If the entered item is a Feature Item, a window will be displayed after the quantity field to allow selection of Feature options. F4 - Searches for Firm Planned Orders if the MRP package is installed. F4 - If the MRP package is not installed, but the COP package is installed, this key searches for customer orders that have manufactured parent items. F7 - Searches for items by number. F8 - Searches for items by description. In change mode, this key field is automatically displayed and may not be changed. Enter the location where the item will be produced. This location must be in the I/M Location File. In add mode, press the F7 key to search for Location Codes. In change mode, this field is automatically displayed and may not be changed. In add mode, the location will default to the one entered for the previous production order. Enter the quantity of the item to be produced. If the item is a feature item, the Feature Selection window will appear after a value is entered in this field. In add and change modes, press the F1 key to calculate the recommended quantity to be ordered. The recommended quantity will be for the location entered above in field #3. To calculate for another location, press the up arrow while the recommended quantity window is displayed. A quantity in the standard format. In change mode, this field will automatically display the quantity already reported as produced in Production Transaction Processing. New orders should not show any quantity reported. Enter the unit-selling price for the item. It is the selling price entered in field #16 of the Inventory Item File. This field may only be changed if the Allow Change To Order Prices flag in BOMP Setup is set to Y. 9 numeric digits with two decimal places and an optional minus sign (9,999,999.99). This field is calculated by multiplying the quantity to be produced by the selling price. Enter the cost for each unit of the item. The default is the unit cost determined in the Inventory Item File. 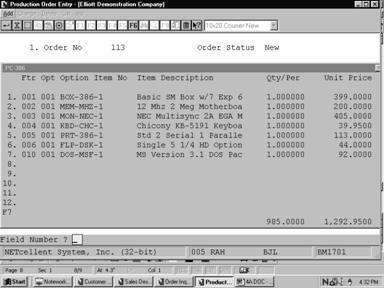 This field will only be displayed if the Display And Print Item Costs flag in BOMP Setup is set to N.
Calculated by multiplying the quantity to be produced by the unit cost. Enter the date the finished item is due. Entry is required. The start date will be automatically determined based on the lead-time of the item being produced. Enter the job number associated with the production order. The job number must be in the Job Code File if the Use Job Numbers? flag is set to Y in BOMP Setup. Entry is not allowed if the Use Job Numbers? flag is set to N in BOMP Setup. Defaults to no job number. Enter any additional information relative to the production order. If the order was copied from COP, this field will display the Customer Name, Number and COP Order Number. If the order was copied from MRP, the MRP order number will be displayed. Enter Y to allocate inventory immediately or N to allocate when the production work order is printed. This field defaults to N.
In addition to the previous 10 fields, the following will appear on the Material Work Order entry screen. 1 alphanumeric character; P = Print Work Order or R = Production Reported. Enter P to print the work order immediately. This field defaults to R.
Select the desired feature code. This number must already exist in the Feature/Option Configuration File Maintenance application. Press the F7 key to search for product feature. Press the F2 key to remove the feature number from the feature item. Press RETURN to select the default or next feature number. All required features must be selected to exit this procedure without canceling the order. The first 22 characters of the item description will automatically display. If the option item is a miscellaneous item, the description may be changed. This field may only be changed if the C (change) field for this option in the Feature/Option Configuration File Maintenance application is set to Y. If this field can be changed, enter the quantity of this option item needed to produce one of the feature items. Defaults to the quantity set in the Feature/Option Configuration File Maintenance application. Enter the starting order number for the range of production orders you wish to print. Defaults to All. Enter the ending order number for the range of production orders you wish to print. Defaults to the starting order number. Enter the letter representing the order statuses you wish to include in the edit list.